Oauthentication entry, hashtag search, user account timeline following using streaming api. This would be absolutely amazing. The Receive Tweets node delivers tweets that contain the specified search keywords, which may include hashtag phrases or screen names of mentioned users. The Receive Tweet Mentions node delivers tweets that include mentions of the authenticated user. 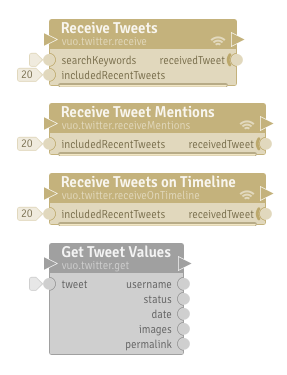 The Receive Tweets on Timeline node streams data and events specific to the authenticated user, including tweets and retweets posted by the authenticated user and the users (s)he follows. Each of the Receive Tweets node variants accepts a parameter requesting a backfill of the specified number of recent tweets before live streaming is to begin. Use of the Receive Tweets nodes requires OAuth-based user authentication to Twitter. The proposed Get Tweet Values node outputs useful data associated with a given tweet, including the author, date, text content, and media content embedded within the tweet. bLackburst, we are in the process of estimating this. We'll post the details when we finish our estimate. I'm looking for this feature in a future project as well. Is this something websocket nodes could do? Chris, Twitter does not currently provide a WebSocket API. However, if Vuo learns how to do WebSocket before it learns how to do Twitter, you could run a local WebSocket-to-Twitter gateway — Vuo → (WebSocket) → Node.js gateway → (HTTPS+OAuth) → Twitter. I'm voting on this node set as described in the initial post (not via a websocket method). this would be excellent. Bonix made a twitter node for QC but I think they ended up doing the Twitter OAuth login in the BonixTV app itself and that enabled their twitter QC patch(es) to work. I know they're keeping an eye on Vuo, perhaps they might offer some assistance with this. Also, there are other queries one can make to Twitter fire hose (cloud) using url pathname constructs to fetch user avatars at full-res etc. I used these in a QC application once, but I was getting my twitter feed from a curated feed that was delivering a stream of selected tweets as an XML feed. The XML feed had various attributes related to each tweet. A bit of research lead me to discover a way to transcode the user name into a url query that would return a full-res avatar image. If there's already a node that can fetch an image via url query then that would work, otherwise a node to do that or a extra twitter node to do that would be good.